The Bath Half Marathon is one of the biggest half marathons in the UK, each year attracting more than 10,000 runners to the city well known for its ties to Jane Austen. It’s one of the biggest events on the fundraising calendar for charities, too, with each Bath Half helping raise approximately £1.2 million for different good causes. Most notably, and perhaps surprising given Bath’s notorious hills, it’s fast, flat, and presents real opportunities for PBs. 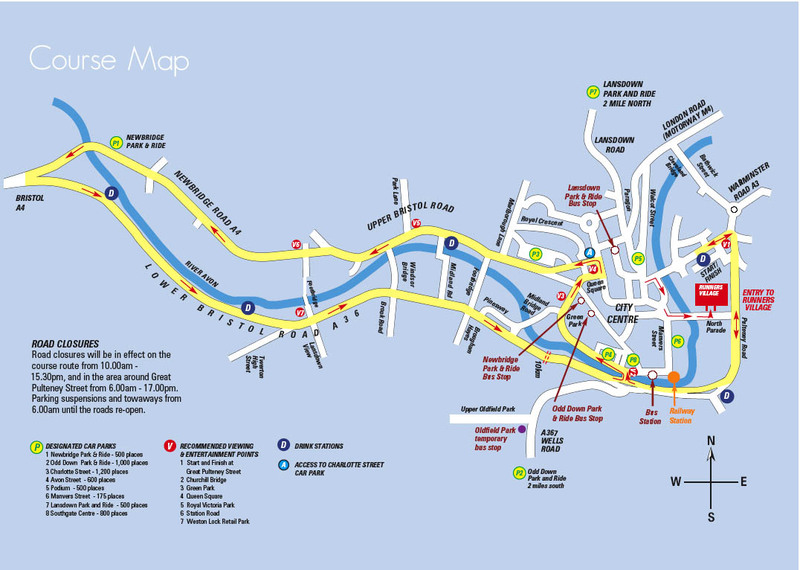 As you can see from the course map below, the course traces the path of the River Avon through the centre of Bath. The course includes two laps, which means that runners will have the chance to appreciate some of Bath’s historic scenery as they slog through the traffic-free race. The course includes two laps on both sides of the River Avon and is pancake flat. Hydration during a race is important, and over substantial distances it’s possible for runners to expend more energy than they have to spare – hence the importance of carb loading for long races. However, with March being a generally chilly month, I’d recommend skipping a few stations. Personally, I might give the isotonic stands a shot as I’ll need to practice drinking something other than water on long races. However, there shouldn’t really be a need for anything more than water, in reality. One of the key considerations for the Bath Half is parking. Being a historic city, Bath certainly wasn’t designed for cars. There is a substantial amount of parking available (see the map, or go to the official website for more information), but don’t rely on it being easy to park. A lot of people will be traveling to the city on the day and there are several road closures. The race starts at quite a reasonable time – 11AM for the main race, 10:55AM for the wheelchair athletes – which makes it easier to arrive in good time. With such a substantial crowd assembling at the start line, it’s best to get there in good time in order to get into your assigned time grouping. I can’t remember for the life of me, but I think I’m in the white group because I’m aiming to complete the course in sub-90 minutes. If you’re in the orange start zone, though, you have a different entrance into the runners’ village in order to avoid congestion. The white zone closes 10 minutes prior to the race start, just to reiterate the importance of being there on time. You should also note that iPods are banned on the course, as with the majority of decent-sized races. However, if you need some kind of noise to get you through, how about the cheers of thousands of spectators? An established city race like this will pull a hell of a crowd, and the atmosphere will be fantastic. Save the headphones for your training runs – you will want to soak up the race experience in Bath. One final point to note – and I don’t want to over-egg this, because really, it is an extremely flat course – is that there is a slight incline to the final stretch of the race. But really, it’s extremely slight. Sure, you’ll notice it because you’ve just run over 12 miles (unless you’re one of the elite runners, in which case you’ll glide over it with a speed and grace that the rest of us can only dream of), but really, it’s nothing to worry about. Just know that for a minimal portion of the race, you’ll feel like you’re running up the most imperceptible hill imaginable. Good to know! Parking is limited, and as far as I’m aware, most of it is on a first-come-first-served basis on the day – so if you’re planning to drive, book early. According to the race organisers, extra trains have been laid on for the day (but also worth booking in advance).